Warm and welcoming, the Hawaiian Islands floral scented sunsets, tranquil waters and natural beauty await you. Spend time with the family doing fun activities, enjoy a romantic escape discovering tropical rainforests and majestic waterfalls or simply relax on the spectacular beaches. Hawaii is the perfect vacation getaway for all travelers. For a limited time, take advantage of a FREE 3-Day Hertz car rental when you book airfare with your package! 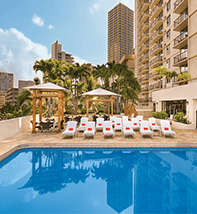 This hotel offers one of the most desirable locations on Kalakaua Avenue surrounded by Fort DeRussy near Waikiki. Amenities include pool, BBQ area and fitness center. Beautifully furnished accommodations create a warm, island atmosphere. Valid for check-in on May 1, 2019. Ask about other travel dates! This oceanfront resort overlooks the beautiful Kailua Bay. It's within walking distance to historic Kailua-Kona town's shopping and attractions. Enjoy a private beach cove and swimming lagoon, oceanfront pool, beachfront luau and much more. 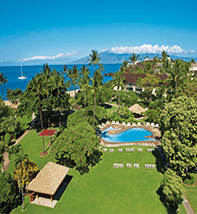 Set amongst 11 acres of tropical gardens along Kā‘anapali Beach, guests experience traditional Hawaiian touches with quilt bedspreads and tropical furnishings. 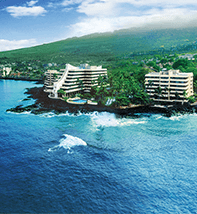 Enjoy the whale-shaped pool, complimentary Hawaiian activities and Hawaiian entertainment. Taste Maui's best regional cuisine, as the hotel's restaurant was voted "The Best Hawaiian Cuisine" by the locals. Departing guests are honored in a special Lei Kukui ceremony. • No resort fee and much more! * Rate is per person, land only, based on double occupancy for check-in on 5/1/19, in room categories shown. Unless otherwise indicated: rates quoted are accurate at time of publication, & are per person, based on double occupancy. Airfare, taxes, surcharges, gratuities, transfers & excursions are additional. Advertised rates do not include any applicable daily resort or facility fees payable directly to the hotel at check-out; such fee amounts will be advised at the time of booking. Rates, terms, conditions, availability, itinerary, government taxes, surcharges, deposit, payment, cancellation terms/conditions & policies subject to change without notice at any time. Cruise rates capacity controlled. Other restrictions may apply, including, but not limited to baggage limitations & fees, standby policies & fees, non-refundable tickets & change fees with pre-flight notification deadlines, & blackout dates. Fees & policies vary among airlines. Contact airline directly for any details or questions. Not responsible for errors or omissions. Pleasant Holidays acts only as an agent for cruise & tour providers listed. CST# 1007939-10. Copyright©2019 Pleasant Holidays, LLC. All Rights Reserved.